I love football! I love the NFL! I am interested in the players and the stories behind them. 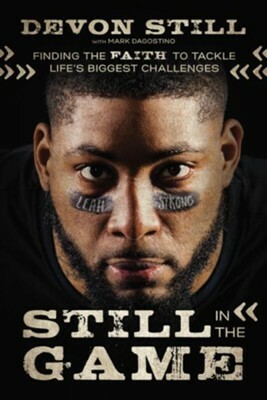 I was very excited to have the chance to read and review Still in the Game even thought I had never heard of Devon Still before I picked up this book. I wanted to get to know a former NFL player and find out what his story was. Those who love football will be interested in this book. Those who have been affected by cancer will also appreciate the book. This book is written in a way that kept me interested the whole way through. Devon is not afraid to share his heart and the emotions that he went through. He is very real in this book. There are pictures in the center of this book that help to bring the story to life. This book shares a positive message. There are some flaws in the theology that Devon Still shares in this book. Unlike him, I don't believe that God would make a child sick because of poor decisions that the child's parents made. I don't believe that God would make a child better because the parents change their lifestyle. I don't believe that works save us. I don't believe that children are punished for what their parents have done. I don't really believe that God reaches down and gives us physical punishment here on this earth for the wrong decisions that we make. Overall, I liked this book for the most part. I give Still in the Game 4 out of 5 stars.